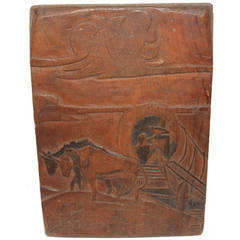 Early 20th century swordfish folk sculpture in good condition on original wood block base. 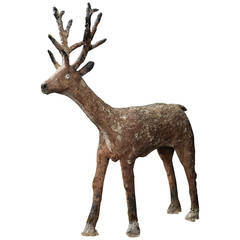 This cast iron handmade sculpture is in great condition and very heavy. Resembles a large handmade weather vane. Great form! 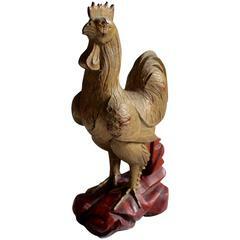 This hand-carved and original painted wood rooster has glass eyes and minor cracks in wood. The condition is good with a wonderful undisturbed surface. Great patina. This hand carved and slight fragment of painted surface in good condition. Very little blue painted surface remaining. 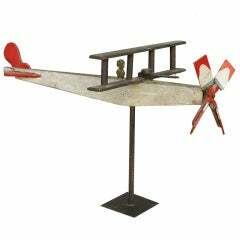 Large, handcrafted wooden Folk Art plane with articulated pilot and original paint surface. 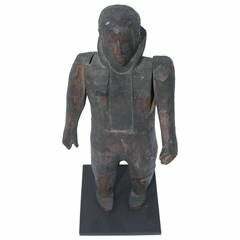 Great hand carved folk art pilot. Concrete sculpture with original paint and seashell eyes. 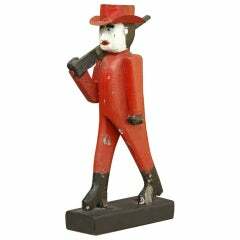 Folk Art surfer sculpture, circa early 1950s. This unsigned example has wonderful movement and patina and is a perfect gift for your favorite surfer friend.